Mono Aji | Ritam & Dyuti | OK Listen! Mono Aji takes its inspiration from Paimona Bideh Ki Khumaar Astam, a much loved kalaam by Omar Khayyam, a Sufi poet and thinker (1048-1132 A.D.). It is not a translation of the original song in Pashto/Dari, rather an adaptation, an expression of the emotions it evoked in us. This is a song about a forest, which anticipates the coming of the rain. 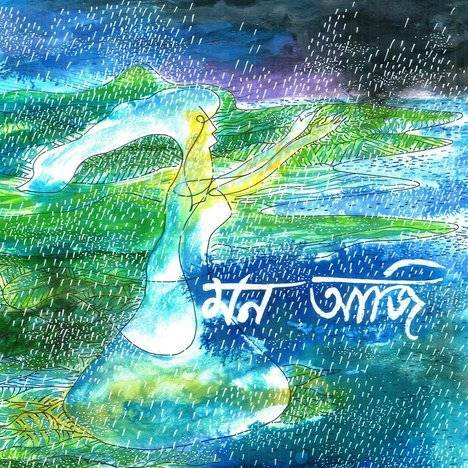 The rain is the embodiment of the beloved, a metaphor borrowed from the long literary tradition of Radha-Krishna motifs. The original song plays with another set of traditional motifs – the wine and the wine-bearer – indigenous to the Persian milieu, and it yet speaks of the same longing and joy of anticipation which the adaptation deals with.